I love cooking with fresh herbs. Unfortunately, the selection in stores here is pretty limited. I can almost always find parsley, cilantro, and rosemary, but that’s about it. The infamous Varnero pot plant delivery included mint, oregano, and thyme. Our family got thyme, which is great, but I have to go knocking on the other Varnero faranji doors if I want one of the others. And how can I make pesto or dolmas without basil or dill? 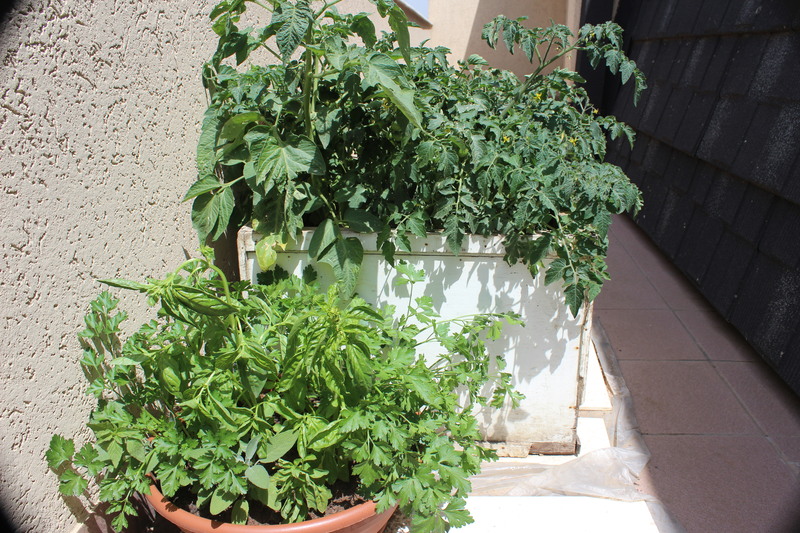 Andreas and I planted basil, parsley, sage, dill, and tomato seeds in the peat pots I’d brought back from the States in January. They were on the balcony for a while, then in our bathroom (which gets more sun than the balcony), and now they are on the roof. Mmm, pesto coming up in a week or two. I hope the tomatoes are ripe before we go away for the summer. This entry was posted in Food, Home life. Bookmark the permalink. Thank you! It’s fun to know where my readers come from. I’m wishing the best for you and all the Turkish people.